Offered here are three team signed St. Louis Cardinals Official Major League Allan H. Selig baseballs from the early 2000’s. The first ball has been signed by 30 members of the 2003 Cardinals, with the signature of Hall of Fame manager Tony La Russa located on the sweet spot. Other signatures include Albert Pujols, Scott Rolen, Tino Martinez, Joe Girardi, Mike Matheny, J.D. Drew, Jason Isringhausen, Matt Morris, Dave Duncan, Wilson Delgado, Woody Williams, Kiko Calero, Bo Hart, Dave McKay, Eduardo Perez, Cal Eldred, and several others. The signatures have been written in black pen. This baseball comes with a LOA from JSA (X79103). 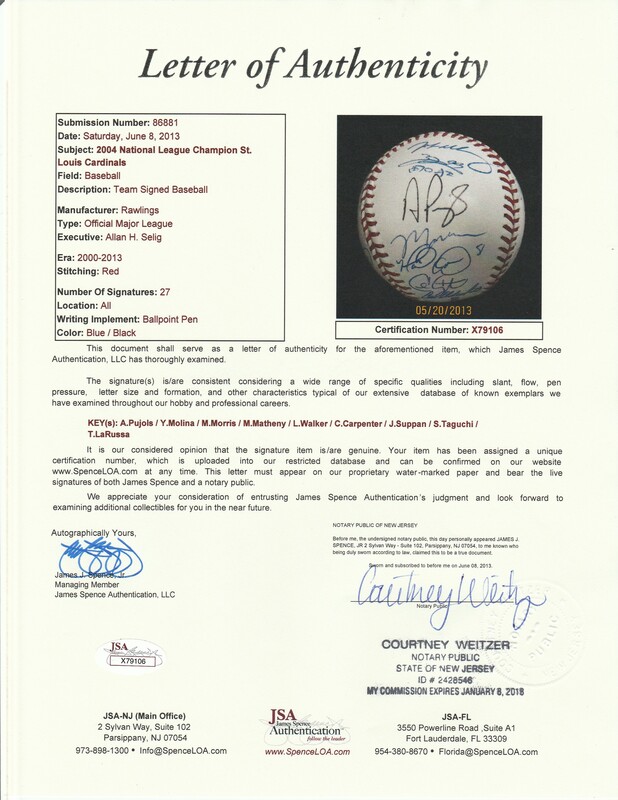 The second baseball has been signed by 27 members of the 2004 National League champion Cardinals. La Russa has again signed the sweet spot, while other signatures include Albert Pujols, Yadier Molina, Matt Morris, Mike Matheny, Larry Walker, Chris Carpenter, Dave Duncan, Dave McKay, Cody McKay, Tony Womack, Hector Luna, Ray King, Marlon Anderson, So Taguchi, Jeff Suppan, Cal Eldred, Randy Flores, Woody Williams, and several others. The signatures have been written in blue and black pen. This ball comes with a LOA from JSA (X79106). The final baseball has been signed by 26 members of the 2005 Cardinals. 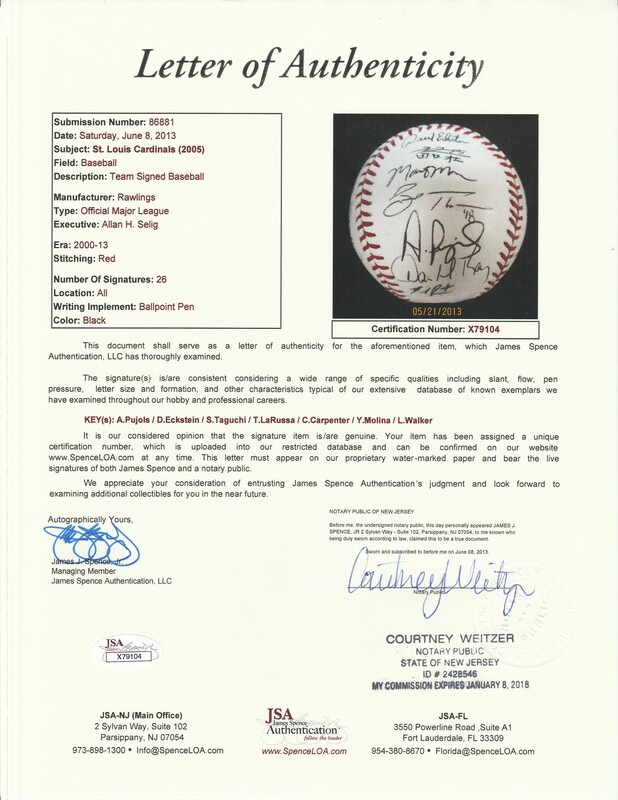 Signatures on this baseball include Tony La Russa on the sweet spot, as well as Albert Pujols, David Eckstein, So Taguchi, Chris Carpenter, Yadier Molina, Larry Walker, Hector Luna, Randy Flores, John Gall, Dave Duncan, Ray King, Mike Matheny, Al Reyes, Abraham Nunez, Cal Eldred, Jeff Suppan, Dave McKay, Brad Thompson, John Mabry, and several others. 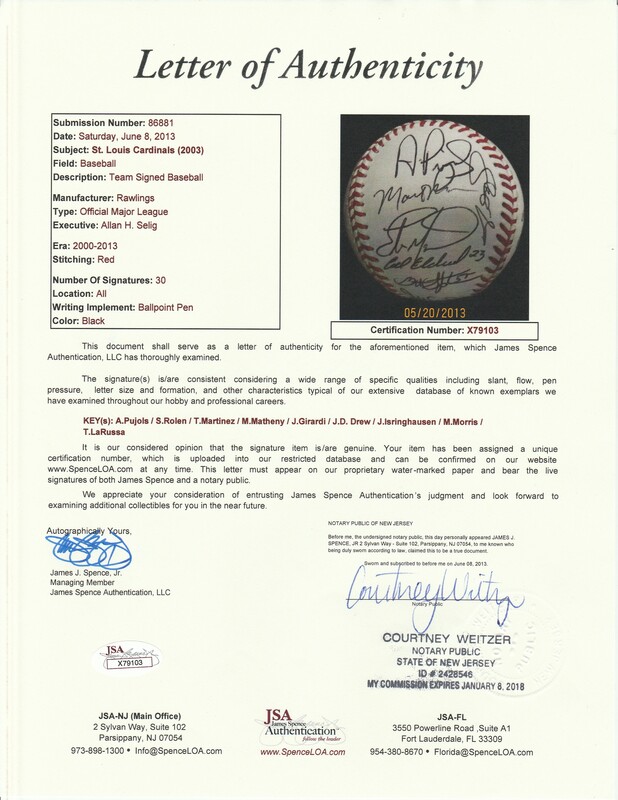 The signatures have been written in black pen, and this baseball comes with a LOA from JSA (X79104).